No one enjoys having their home become a hub for pesky rodents. Their presence is bad enough, but mice and rats are also carriers of bacteria and dangerous diseases that put the well-being of your family at risk. If you contract lymphocytic choriomeningitis (LCM)—a disease carried by mice—you will experience symptoms including fever, lack of appetite, headaches, and nausea. Other health concerns associated with mice are increased asthma, salmonella, and Lyme disease. Contraction of these diseases can be prevented by acting immediately after discovering signs of rodents in your home. Have you noticed unusual droppings in your home lately? If the answer is yes, then you most likely are suffering from a rodent infestation. Droppings are greatest in number near food storage areas, as well as hidden places, such as cupboards and under sinks. A large number of droppings in one area is indicative of a nest and will require further inspection by a professional. Mouse droppings are less than one centimetre long and are pointed on both ends, while rat droppings are larger than one centimetre. Another tell-tale sign of rodents is the presence of a strong, foul odour. This odour is caused by the accumulation of urine and is worsened if there is a dead, trapped rodent. If you cannot tell where the smell is coming from, there could be a dead rodent stuck in one of your walls. Many pets will act strangely in the presence of rodents and are able to accurately locate the source of the stench; therefore, if one of your rooms smells and a pet is drawn to a particular area, contact a professional to remove the trapped animal. Rodents will create nests with pliable materials, such as shredded newspaper, fabric, and dried organic matter. House mice nests are usually made in a round structure and are ten to twelve centimetres in diameter. Mice nest in order to raise their young, so they are found in places that provide warm and dry conditions and close to food sources. Typical areas include secluded corners, cabinets, the base of kitchen appliances, and garages. Most gnawing happens on wood surfaces, but rodents will sometimes gnaw on other materials, such as electrical wiring, which leads to fires. The gnaw marks of mice tend to be the size of a dime and have clean-cut edges, whereas those of a rat are the size of a quarter and have rough edges. If you see a rodent during the day, there is likely a larger nest than you initially thought. This is because rodents are nocturnal and if seen in broad daylight they are usually seeking food or have just been disturbed. Rodents also multiply fast, with the typical mouse having five to ten litters per year, and an average of six babies per litter. This means that even if your rodent problem isn’t big now, it can grow exponentially in the course of just a few months. 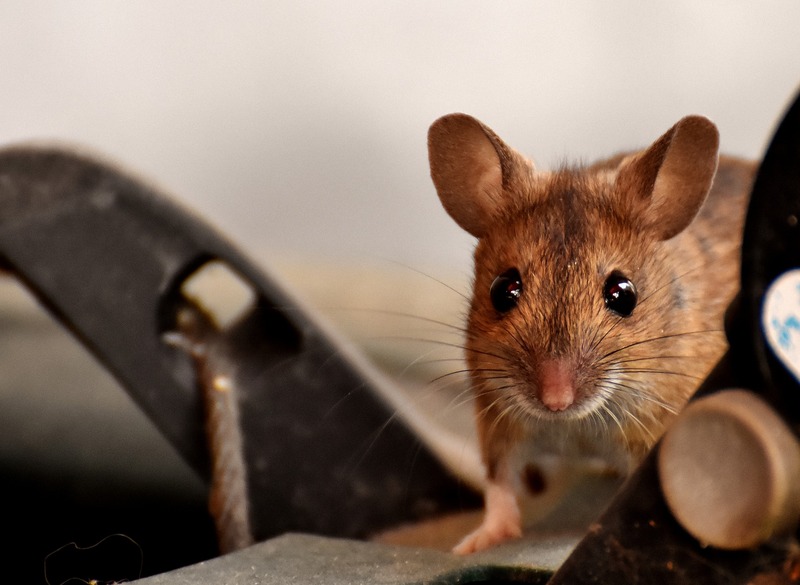 If you suspect your home has fallen victim to rats and mice, contact our pest control experts that use proven techniques at Raider Wildlife Control. We serve many areas, so call us at 1-844-482-7243, or fill out your request for service online today.